As the B flew toward his destiny in the northeast, another letter was about to be brought to light--from the very depths of the ocean! This letter was the only one that could possibly do justice to beings that were so spectral and powerful that the Atlanteans steered away from them--having rued the day they created such monstrosities. A symbiotic triad, a tripartite species, the Algol lived up to their ancient name, The Ghoul. This was true particularly in the case of the Medusan component, again three in number, which came to be known as the Gorgons. These monsters, ghoulish sterile females, were famed in the Greek account where a hero named Perseus was said to have slain a Gorgon, aided by a helmet that rendered him invisible and the use of the god Hermes’ winged sandals that enabled him to fly to the distant island where the Gorgons resided. The dreadful Gorgon trio was real enough. They would not have been entertaining to the Atlanteans, their creators, if they been mere celluloid or phantasmagorical figments. Preferring the real thing, the Atlanteans genetically engineered them for amusement, but they were so terrible in reality that even the Atlanteans were appalled and stopped production as soon as possible. Something in the experiment had gone wrong. The Gorgons possessed powers that make them very, very dangerous--the ability to traumatize, “freeze” the souls and psychologies of their prey, for instance, rendering anyone they so much as looked at virtual stone or statuary. At first, this was thought highly amusing. Criminals and poor villagers were exposed to the Gorgons and turned into garden statuary. Of course, the statues died after a while and began to rot, which made a nuisance for the gardeners on the estates of Atlantean nobility. This amusement, however, was short-lived. A royal princess happened to get too close to the fun and was turned into living stone. The emperor of Atlantis heard of it and immediately banished the Gorgons to a place of safe-keeping, but it was horrible job for the jailors. One-way windows and mirrored glasses, which the Atlanteans had, did not shield anyone. Awkward as it was, they had to look into mirrors as they rounded up the monsters and herded them into flying craft for removal to a well-guarded den in the mountains. The Gorgons did not go willingly into exile. They put up such a fuss many men glanced in the wrong direction and paid dearly for a moment’s distraction. Unlike other monsters of Atlantean provenance, once their guards were buried in avalanches or drowned in the cataclysm that swamped Atlantis, they were able to fly away from the doomed motherland and join forces with species they felt were most akin to their own makeup--scorpions, spiders, and such. As for the Greek Gorgon-slayer, he never actually existed, not at least until the time of Molu, and then Molu wasn’t exactly molded according to the classic Greek model. Rejected at birth by his makers (he was the product of a shameful liaison between a shameless empress and a bull), he was put in a long-lasting crystal and flown to the deepest trench in the Pacific Ocean and dropped to the very bottom. Molu’s presence in the depths, like Jona’s once in ages past, was unknown. When finally the great block of crystal in which he was encased by the lords of Atlantis split in the heat of a new oceanic vent, it rose at the same time, shooting to the surface and he struggled free. Free! The infant minotaur swam on the surface, but no shores of Mother Atlantis greeted his pop-eyed bovine stare. He did not know it, but he was in the Great Western Ocean. He swam westward for a time, but the ice grew thicker in the water. Turning, he swam to the east, and it grew warmer. Instinct now took over, and he was drawn to the Southern Continent, one the Algol had reluctantly vacated. A powerful swimmer, he reached the shores and climbed up into the mountains. He knew this was not his birthplace, sensing that he had to go further and would find it by crossing the mountains. He was almost through the Cordillera, the Golden Mountains, when he stepped amiss and plummeted into the depths. He soon found he was not alone in the huge, man-fashioned region. Women lived there, in a realm that his own makers had devised in ages past, then forgotten in troubles that fell upon them. Found and kept secret by a man clever enough to enslave the entire world for a time, its dynamos and computer systems were turned to his purposes and he meant to rule from there, if need be. In fact, it was to this place he may have been journeying, not to a hidden starfleet base in North America, when he was intercepted. When he did not return, Atlanteans who had hidden there out of sight of his men rushed out, killed the guards and reclaimed the entire facility. Surfacing only to capture slaves from time to time from the human population and later the half-beast half human races, the Atlantean Amazons and vampires sustained themselves over many generations. As for the Atlantean royal court that fled the planet, returning to Earth at great intervals, the hidden city was no longer of interest. Even though its design and location had enabled it to survive the cataclysm that sank Atlantis proper, It was still thought too dangerous a place; they preferred the surface anyway. As a last resort or refuge, it had never served its purpose, and so they consigned it to cave bats and spiders and its tenacious, polyglot caretakers. These part-Atlantean, part-human, part-beast “Guardians” of the hidden city welcomed Molu, thinking he would be their protector and guardian when he was grown. Feeding him, nursing him back to health after his tremendous fall, they expected much from him, only to be sadly disappointed. Shaggy-haired beast-man, he was yet the key to something greater, a new world free of the Algol. But to the wretched remnants of the lost Atlantean civilization, he turned into a mortal threat, and they tried to kill him many times. Fleeing their poisons, attacks, and threats to cut off his beloved tail, he climbed back out to the surface world. Growing mature, he took a mate among the savage Wolflings (who had the appearance of a half-man, half-wolfhound species) born of the long-ago hydrogen bombing of Buenos Aires. But among the Wolflings, his overbearing, brutal strength and violence could not be endured by their chief for very long. Molu’s wife was killed when he got angry one day and she happened to be in the way of his pounding hooves and butting head. Enraged, the whole Wolfling tribe rose up against him, to drive him off. After he slew many of them and the rest fled into the jungle, he returned to the Crystal Mountain in a furious and vengeful mood. Molu the matriculating Gorgon-slaying E had reason to be angry. Rebuffed so many times, able now to make his rage felt, he turned from wiping out the Wolfling tribe to staging a surprise attack on the nest of hateful women under the mountain by the big lake. He had vivid recollections of them, how things had been when he first fell into their midst. The women who gave him his name lived under the mountain in their city. None at first would even touch him. Then one of the lowest and most aged of the servants--a female of the despised class that was about equal parts of ape and human--spirited him away to a dim recess, and raised him there on slops the others threw away. A chieftainess ruled the women in the underground city with an iron hand. Many times she gave orders to do away with him. When the servant-woman was not around, they came for him. Poisoned mush was put in his trough. Then a big club struck his head very hard as he slept. Snakes also did their worst. But he was indestructible, and always survived their attacks. His growth was terrific. Within a few years he was so large he frightened even his foster mother. Fleeing him one day, she threw herself at the mercy of the other women. The chieftainess forgave her, but on the condition that he be fully subdued and his abominable tail removed. He heard other voices and turned. There was the sound of hurrying feet and heavy breathing. Then he knew the whole pack of women were coming for him, and they would be carrying their planting sticks. Against them, he knew instinctively he would lose, for he was in no way full-grown. Yet another instinct told him his salvation lay in the outside, upper world which he had only fleetingly seen. But the old, smelly guardswoman in his path blocked him. Then the man-part of him had a smart idea. He gave himself up. With shrill cries the women rushed and seized him. Like gadfly stings their sharp planting sticks prodded him, claws sank into his arms, and their leader told him that his problems would soon be over, and soon he would forget what had happened to him. The chieftainess stopped abruptly, words trailing off. Tall and dressed in ceremonial, black robes, carrying a torch, she was a fearsome sight. In her other hand she held a long, curving machete. Seeing the machete, Molu knew he had to do something now, or it would be too late. He had thrown them off guard by ceasing his resistance. Now he must act. Wrenching suddenly from their grasp, he rushed straight through them and over them to the exit. His hooves flailing for footholds, he fought upwards, up and up, disregarding the ladders woven of vines that the women had constructed. He reached the first operating platform that had its own manual stick It was an elevator that would take him up through the access tube that bridged the sea in which the city floated. Though knowing nothing about its controls, his frantic movements struck the controls and instantly he was shooting out of reach of the frantic women climbing up the tangled rope ladders from below. That was such a close call, he sweated whenever he thought of it in days afterwards. Now that he was full-grown, he was no longer afraid of their planting sticks and knives. He would kill them all if he ever saw them again. 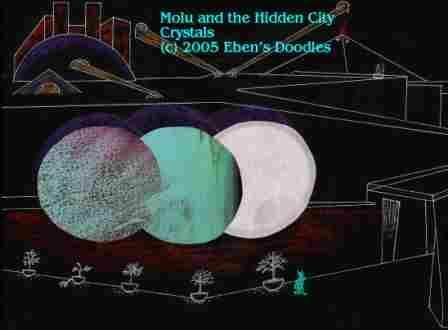 Now, back in the hidden crystal city, Molu stepped off the platform, slid down the remaining stretch of access tunnel, and burst through the unguarded exit. “Where are the women?” he wondered, glancing about. “Are they dead?” He strode confidently ahead, a tower of shaggy hide and muscle. As he clattered down the corridor he surprised an old woman, of the kind that had mothered him in his infancy. She was sweeping the floor with dried palm branches, her back so bent with toil she was nearly level with the floor. He walked up to her so she could see his feet and shaggy ankles and know who he was. He recognized her by the peculiar bald patch and blemishes on her skull. It was the one who had fed him, though she had grown so much older in the three years she was otherwise hard to recognize. “Why, ya ran ‘way three year ago!” she exclaimed up through broken teeth and wide gaps, dropping her broom. Her eyes marveled at his size and girth once she screwed her eyes upwards in her head. “My, what big, ugly brute ya are too! Ya remember me, Old Karah, who nursed ya as a child? Our lady would’n’a have ya, but I--” Her head still screwed upwards on her withered neck, she backed away, her face full of sudden misgiving, for she had seen the whisking of his tail. “Ibsen-beast!” she scolded. “You ran ‘way when they wanted to make you decent like us! Aren’t you ashamed, coming back here with that devil-thing still attached to you!” Molu paid her no further attention. He ignored her angry chatter as he went on and explored a chapel. “Git! Git!” she cried, though she herself wasn’t strong enough anymore to chase a fly out. Anytime he chose he could snap her in two with kick of his hind leg. Crude oil lamps flickered on the stands. 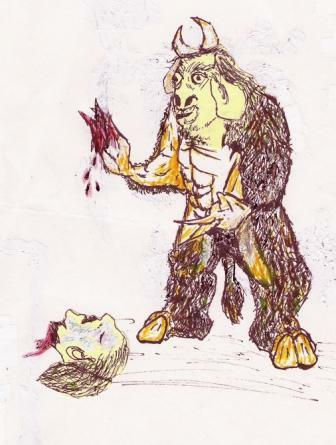 At the altar a monkey from the Upper World lay bound, readied for sacrifice, its eyes rolling with terror at the big, blood-spattered collecting bowl set beneath its head. Molu crossed over to the Panel that controlled a video screen. The crystalled panel was considered very holy, only the chieftainess could touch it. He knew it must not be touched by anyone else. He never had. It was consecrated to the god of the City. But now he struck at it randomly with his big, hard, splayed finger-hooves. Light suddenly flared from the screen curving across the room. “Coming to you, the President-Premier of the World, First Citizen Dr. Chillingsworth!” the choir of invisible angels announced. “Hail, hail, you through whom the curse of nationalism has been lifted from the Earth! Hail, you who have ended at long last the divisions that brought war, war, war and destroyed peace from among men! Hail--” At the same time trumpets sounded for the entrance of a divine leader, and the world’s savior appeared on steps before a huge golden throne set high above masses of humanity. In his hands he held out gilded olive branches to the watching and adoring world audience. Molu did not like the voices, or the glaring picture, and he especially did not like the speaking god. Turning his back to the screen he put his half-finger-half fore-hooves over his sensitive ears. But he could still hear the man speaking about those who wanted to turn the world’s clock back and prevent the new, golden age bursting upon them, with the crowd roaring its approval after every five words or so as he described the means necessary to deal with such nonprogressive, criminal elements. Molu’s eyes darkened and flashed readily at the centers. Then he turned round and struck out at the mirrorlike screen. He smashed through the crystal, making a gaping hole, and the delicate workings began to dissolve in flame and smoke. He heard footfalls, turned, and saw the enraged chieftainess in the doorway. She swept toward him with her armed guards. All were wielding planting sticks. She shook her elephant-carved staff in his face. “Chillingsworth the Most High Citizen is angry!” she cried. “You have dared attack his holy image! You must be put to death for this sacrilege against him and the Contingency Plan! You shall be the sacrifice this day along with the monkey!” Molu’s snorting was heard. He was now very angry. Anger not only made him difficult, it shut off the source of his cunning man-thoughts. Transformed to brute power, he was a thoughtless dynamo of ferocity. “Terrorist!” hissed the chieftainess. “Ibsenite recidivist!” the head of the quality control department croaked. “Ha! You won’t get away from us this time!” crowed yet another. Molu seized one of the nearest by the neck and squeezed. She gave a shriek. A moment later her eyes bulbed, and bloody spittle ran from the side of her gaping mouth. Then he threw her down. Several women rushed forward with planting sticks to stab him in the face or his vitals. But he was just too big. They fell back away in alarm as he bellowed and lunged at them. The chapel was a complete shambles when Molu was through with it. As for the women, he killed all he could get his hooves on, and the survivors fled. Stamping with fury, he followed, determined to eradicate the entire colony if he could. That was not so easy. The women knew the city far better than he. Even they did not know all of it, however. Forced by his probings, the five women who ran from Molu entered sectors unknown to them. They had no idea where they were headed. It was either run or be tracked down by Molu, who had a keen sense of smell. He could also discern their thoughts, so there was really no hiding place in the city that would completely shield them from him. The boulevards that converged on the city’s center like spokes in a great wheel, part of which could only be seen at one time. All terminated at a central pool. Dimly lit now due to the gradual break-down of the lighting system, Molu and the fleeing priestesses could see very little of the structures along the route and leading down to the same level as the Central Power/Communications/Administrative Systems Unit ( CPSU). Here were the main administrative offices and palaces of the elite, set in high towers and a pyramid. No workers were even permitted in former times to walk the avenues, which had been grand in their day, with shooting, colored fountains and light-bathed columns and statuary, and potted trees and flowering beds and many other attractions carefully cultivated to approximate those of the Upper World. Since then all such things had been pushed over the edges of the walkways into vast canyons that opened up beneath. Now the water had ceased to flow into the indoor tower gardens, and the shrubberies and trees had long withered from lack of water and light and perished. Even with the loss of the vegetation and flowers, the palaces and temples and government facilities, on the surface, were still magnificent and of a size beyond anything humanity had produced. Trying first one building and then another, the women sought refuge, only to hear Molu’s snorting and stampings yet again, which forced them yet onward toward the CPSU. Finally, they were reduced to specks against the curving wall of the glowing CPSU chamber, scurrying for their lives just ahead of a black speck several times larger. They were doomed, since his stamina was also many times that of theirs, and with his abilities he could not fail to hunt them down. Suddenly, Molu skidded to a halt after a last leap and bound carried him right into the midst of the shrieking and exhausted women. Lightning erupted from his head at that moment, emerging like horns from his huge, shaggy head. It arched and became spears that shot at the women. One moment they were there, the next they were staggering in the midst of flames and then melting to ash. Having set off a fire alarm, the whole sector reverberated with a booming note, the sound shuddering like a giant steamship’s foghorn. Robots popped out of the pavement as panels slid aside, and in perfectly synchronized movements they converged on the fire, spraying fire retardant from canisters. As soon as the fire was extinguished, the robots retired to their chambers. Molu, who wasn’t challenged by the security robots, was left alone. He had thought of doing them some damage too, but they moved so swiftly and had the fire out in so short a time he had no time to react. Having exercised his awesome new power for the first time, he felt a little sleepy. he yawned, and sank down on his haunches where he was. Eyelids fluttered over his large, deep-brown eyes. Abruptly, they shot open. He could hear strange voices, and in his inner eye he could see approaching a glistening pearl, or string of pearls, as it penetrated the Spheroid Chamber and grew in size. At the same time he cocked his ears, though he had heard them in his inner ear, which was the one that penetrated every wall in the city. Dark-green and black-mottled creatures stepped out of the pearl-like envelopes that had entered the CPSU chamber. They stretched membraned wings and an array of sleek, woman-faced heads with writhing, snake-headed hair as they viewed the biform “Eye Sphere and Tongue Tower” wisdom-crystal, the mobile backup power and intelligence center for Poseidonia, a trylon slowly and endlessly circling a perisphere for age upon age, its orichalc circuitry computing ceaselessly despite the long absence of its creators. It was this tri-form crystal that had sent up such powerful vibrations at various intervals that even Wormstar was attracted once in the long-forgotten times of Pre-Re-location Earth. The eavesdropping Molu heard nothing for several long moments as the Gorgons, silently, considered the matter. “But,” hedged one Gorgon, “the Romany are our allies too, and they supply certain things to us; if we destroy them, we lose certain amenities. They are useful, don’t you think?” “That is true,” replied the leading Gorgon sister, the one with the neck scar, “yet we need not destroy all of them, just enough to lure Elektra into our trap. Once that is done, we can eliminate the meddler once and for all. Earth, then, will be ours forever! Forever! And--” The excited Gorgonian telepathic chatter ceased abruptly. They had sensed Molu, small as he was compared to the CPSU chamber and their own selves. “From what I gather, he is in no condition to understand what he may have heard,” commented a Gorgon. “But I don’t like being listened to, particularly with Elektra’s spies everywhere. Let’s go. This shaggy beast doesn’t matter. How he got in here, I have no idea, but he can remain alive. We needn’t kill him ourselves. We should get the Crystal to do it after we have departed.” “True,” laughed a horrible sister. “Why should we show our faces to him? He isn’t worth our attention, when we have so much more to do before we can go to war.” Their decision made, the Gorgons concentrated on the Crystal, directing their thoughts into it until they had penetrated the security system. After that, they called up from a terminal port and injected their instructions. That done, shimmering pearls formed around their Gorgon bodies. Suddenly as they appeared, they vanished, diminishing in size until they were out of range of Molu’s incredible perceptivity, diminishing so greatly, in fact, they could fit comfortably inside a geodesic Fullerton molecule. The conference of the Gorgons within the CPSU happened so fast, from beginning to end, that Molu looked wildly about for a few moments. He was certainly the creatures were still there, hiding somewhere in the walls. He rubbed his eyes and scanned outwards with his wide-ranging, inner eye. His laser-like gaze searched the City in all directions, even to the Forbidden Chapel. Then he turned to the Crystal itself. What he saw defied his comprehension. The minute configurations he saw were so innumerable and vast in scope that he had no idea what the thing might be. It looked to be alive, since it danced with light and changed from white to different colors, but was it? It had no head or legs and hooves like a proper animal, and instead its body was like three giant yolks floating in water. When nothing more happened, Molu lost interest. He also lost interest in the City and returned to the surface. Before long, he had grown lonely, and the Wolflings, who were short in memory, took him back into their company. The reconciliation did not last very long. “You burn her!” snarled the brother to the new woman he had taken. “You burn her!” Molu the Two-Horned looked upon his second wife’s smoldering corpse. It was true. He had done it. But how could he explain? He hadn’t the words. A moment’s annoyance, and lightning had burst from him to her, and she burned up in a flash of fire. It happened so fast. One moment the wife he loved in his fashion was alive, then she was writhing ash! Foliage around him drooped discolored and frost-bitten. Sleet poured coldly down from the darkening sky--sleet in tropical Ahpikondia. It seemed he was upsetting all of nature with his displays of lightning. Also, a violent concussion after the lightning struck the ears, and wind biting cold sands in his face as tears formed in his huge eyes. He bent his head in sorrow the moment a rock grazed it. Hardly feeling the blow, he looked up dumbly, and another rock struck, nearly putting out an eye. He shook his head, seeing the Wolflings gathered around him for the first time. He saw their rage as they raised dewclaws shaped like human hands to throw more rocks at him. It had all happened before, and now Molu, grown older, with more adult feelings of grief, reacted differently than he had in the past. Snorting with pain as the shower of rocks struck him in the chest and belly, he turned and started off to his shelter. For his dead wife’s sake, he fully intended not to hurt her people again. Behind him the Wolflings howled, for against such a beast they knew they could do nothing that could really hurt him. Two-Horn reached an old lair of him under an overhanging ridge of basalt, and lay down. Tears well from his eyes as he remembered his lost mate. He had done a bad thing to her, he thought helplessly. Why had he done it? He should not have done it, and now she was dead. Dead! A brilliant Speaking Light suddenly put a stop to his commiserations. Molu! Hear Me! I have not sent a messenger to you. I myself have come. I will give you a new heart, a new mind, a new spirit! You will no longer be a foul beast. You will be a new creature in my image! I will heal your hurts and give light to your eyes so you will not have to stumble in the dark. Listen! I will give you my Words, and with them you will fight the darkness that will come against you. But first your guide will teach them to you My ways, that you might learn to walk in paths of righteousness. The Voice in the light must have added understanding as well, and some wonderful sort of healing balm of presence, for Molu, after rearing up in surprise, settled back down almost immediately, surprisingly passive and receptive to the Voice and Light as they ministered to him. After the Voice and Light had gone away, Molu lay a changed being. He was still a beast in appearance, but internally a spark was ignited starting a vastly new and different Molu. He blinked his eyes slowly. Then he lay his massive head down on the ground, his sorrowing heart at peace, and he slept. And the man spoke the utter truth! Molu, under the hand of wise discipline and wisdom, submitted increasingly to training. Before long he was speaking verses from the great Book the man brought--or, rather, a bright, shining being in red-gold garments delivered to the cave. There was another book, too, but much smaller. With it Daniyel (for Molu learned his name) taught letters and also words that would empower him soon in his battles with the enemy. Everything the Voice of the Light had spoken came to pass. Molu was healed of the broken heart suffered when he slew his second wife. He was also forgiven of other wanton crimes, the murders of the old women in the Hidden City and the slaying of the Wolflings. As he grew in understanding and spirit, he acted more like a man than he had ever been designed to be. The beast fell off from him more and more; the Atlantean monster he had been, created only for perverse amusement by the Atlanteans, sloughed off increasingly. He still looked rough and shaggy, but his inner being was changed to that of a God-fearer. Now he had come to trust and follow the Most High God--a complete transformation of what had been a mindless, violent beast. He still had problems with the old beast nature, however; it was not entirely eradicated, it was only subdued by his new spirit and new mind. Many times he felt he wanted to rise up immediately and test his mettle against the enemy, the widespread Algol who infested the major portion of the habitable earth. Each time Daniyel admonished him, telling him he was not yet ready for that. Without the Word of God firmly implanted in his heart, he would fare like poor U, who nearly lost his mission, rising to the challenge only at the last, and then at the cost of his life. Feeling contrite, Molu submitted, though a titanic struggle went on his soul, the right way as opposed to his old nature. Once or twice he was even tempted to strike out with his hoof and cut the old man right in half, particularly after he had chastised him for some minor infraction, like running a Wolfling off a cliff or sitting down on one and crushing him. The Wolflings! They did not believe Molu was a changed beast, and hung about Molu’s training camp, taunting him as much as they dared. The Old One did not seem to hear any of it. But Molu’s ears stung with the obscene laughter and jests. “Look! He is a dog to this old man, to be whipped about and kicked! And he doesn’t mind it!” All day long things like that were flung at him. Finally, one day when Molu could not bear another moment of their taunts and jeers, Daniyel turned sharply to Molu. “I’ve heard every word! But rejoice that you are counted worthy of persecution! Don’t react to them. They are ignorant of the ways of God, which have been taught to you. You have a golden treasure, worth the whole world and more! Don’t throw it away for a few moments of vengeance. ‘Vengeance is mine, saith the Lord.’” Hearing this, Molu let out an enormous blast of pent-up frustration and steam. He turned his ears away from the Wolflings, and though they let him have it with doubled venom, he kept his head, and gradually they faded away, unable to get a rise out of him. One day Molu noticed something was different. It was so quiet! Too quiet! He went beyond the camp, searching and searching, but he could not flush out a single Wolfling. They had gone! Given up! The Old Man was right! Molu, feeling a wonderful triumph in his spirit, returned to his training with renewed vigor and joy. He learned all the verses put to him. He submitted to all the tests and obstacles that Daniyel could devise. He passed! He got a top grade! He graduated! What an achievement! Molu felt like the whole world was a wonderful, shining place at that moment. Now he could go forth as the Lord’s mighty champion, to fight and destroy the enemies of God and man (for Molu, despite his uncouth, bovine appearance, knew himself a true man). But more important, he felt redeemed, washing in the cleansing Blood of God’s Son! Not only was his guilt washed away and he received absolute pardon, but he received deep healing for the rejection he had suffered since he had come, a beastling, to the women under the mountain. Yes, he still had vestiges of the old life, but they no longer mattered so much. A shaggy hide, a tail, a bullish physiognomy, that was only the outer shell, when he knew himself to be made in the Image of God the Most High--reborn, in fact, into that Image from the abortion the Atlanteans had made him. He was happy for the first time in his existence! His midnight had been turned to day. He felt great joy, thinking of the future ahead of him as a child of God and a Dire Knight, in which he would receive all that had been promised in the big Book. He had been made a son of the Most High through the redemption of His Son, the Alpha and Omega, the A and Z, and the Aleph and Tau--He who was the First and is the Last, the Beginning and the End, and the New Beginning. Now the training he underwent was rigorous, and it went like this. Reveille occurred before the crack of dawn. Molu scrambled from his bed, his eyes glued shut with sleep, and rushed to the appointed place, and there he stood at attention while a trumpet was blown. Molu never saw, at that hour, who was blowing the trumpet so fiercely and loudly. Making his tail shoot out stiff as a board, it shook the very ground he stood on. Fully awakened by the trumpet blast, Molu was put through some paces by his trainer. As Daniyel called out a letter from training manual, Molu had to answer with the appropriate verse as he was marched up and down. The verses electrified him with enormous power, and Molu enjoyed bellowing out the responses. By the time this part of the morning was completed, Molu was ravenously hungry. But Daniyel never allowed him to eat a bite until they learned several new verses. Later, after a sparse and brief breakfast of raw greens and fallen tree fruit and nuts, Molu continued in his training for the rest of the day. Hearing and reciting, he was drilled in the verses that meant life and death to him and the success or failure of his coming mission. A strange thing happened to him at the same time he was reciting. The words burned into his heart and stayed there, glowing away until he felt sometimes he might burst with the golden glory of his inner treasure. He wanted to rush and tell the Wolflings everything he had learned. Indeed, he had done so--once. Thinking he just had to share a particular power-verse, he bounded into the Wolfling camp, blurted out the verse, and then saw the camp burnt up in a blinding flash of sheet lightning. It was a terrible disaster, but Molu seemed to learned best by the hard way. After that, he kept his “war words” to himself, recalling that Daniyel had instructed him to keep them until the exact moment and in the exact place they were needed. Finally, the time came that Molu the E graduated from military school. Daniyel, satisfied that his trainee had learned the ropes, stepped back--then Molu looked for him, he had vanished! Molu looked everywhere for the old man, calling his name repeatedly. At last it dawned on him that he was now commissioned, and it was useless to keep looking for his trainer, for Daniyel might never come again. Molu wept, just the same. He loved the old one, regardless of the rigors of the training. Feeling the terrible loss of his mentor and friend, Molu wandered and found himself gazing into the vast glow of the bi-form Crystal. He had no business loitering there, for his mission lay elsewhere, he sensed. What would the Almighty direct him to? he wondered. He knew the word to move out might come at any moment. Suddenly, he bellowed in pain, for a bright light was shining like a spear and stabbing him in the shoulder. He lunged away, escaping it, but another spear of light shot at him, and yet another. He jumped here ands there, but he couldn’t move fast enough. The spears of light multiplied, and he began to burn all over his huge body. Driven by intolerable pain and terror, Molu did something entirely without thought. He took a huge leap into space, not considering that he was leaping into the Crystal itself. There was a tremendous crash as he plunged through the outer circuits, thrashing his way down, down, down. Finally, he came to solid footing, but all around him was darkness, flashing lights by the trillions, and ear-splitting noises, some very high-pitched, others very low and booming. Confused, startled, still in pain, he began to move, smashing his way this way and that to get free. But the alarms grew even louder, and then, piercing the outer envelope, he fell through, finding himself outside the Crystal, which was shooting out rays and racing with color of every hue. Voices sounded, employing every language man had ever spoken on the Earth. Molu, after a time, began to hear words he recognized. Molu found his mind filling with point after point of a rather lengthy contract. It stated exactly what “powers” the Crystal had to offer an “ally,” and what was not to be expected from each of the two parties, and also gave the cut-off date for the agreement. An ending clause in very small lettering he could not read detailed conditions that would compromise and even terminate the contract. Since the covenant was put in terms Molu could understand, he looked it through and came to the conclusion that there was no harm in it that he could see. But could the Crystal actually do what it promised? Was the Crystal that powerful? Molu was doubtful, as he gazed at it. He had nearly destroyed it, yet the Crystal claimed it could use “nano-technology” and “robot” to repair itself. Once repaired, it could also lift him high above the earth, put spears of light in his hands that he could throw at his enemies, and then bring him back safely to the ground. If he chose to use his own lightning, that was up to him. The Crystal anticipated his doubt, and in seconds ran through a series of simulated flights with him, showing him what he could do and also could not do with the Crystal’s powers. Molu bellowed with huge satisfaction as he watched a tiny Molu flying higher and faster than any eagle, then shooting great, shining spears at his enemies, then finishing the job with lightning bolts. It was wonderful to his eyes, watching them burn up. He wanted to do it. “Good!” declared the Crystal. “Now would you like to perform a test of your new powers? We can do it on what you call the two Moons.” Minutes later, Molu was destroying entire lunar mountain ranges with his lightning-like rays, gouging out new canyons many times the size of the Grand Canyon on the West Bear Island of North America, and even whipping up vast storms on the surface of the fiery Day Moon. Shielded by the Crystal, Molu had the time of his life playing havoc with nature. So an alliance with the Great Crystal seemed a good thing to Molu at the time. He was spared having to wait on God for the words that would direct him. Molu reasoned that he already knew what to do. All he needed was the power to fly, and this Crystal was giving him all he power he could possibly want. What more could he ask? He wasn’t going to war alone, but with a buddy. What could be better? At the time Molu came to this view and was flying about the two Moons and exercising tremendous powers of destruction, Earth’s ocean fronts grew still. Terrorizing polar storms besetting the many corners of the Earth, even extending icy fingers into the subtropics, now quieted and disappeared. It was a great Silence. The Algol, Rom allies, and the Gorgons as well wondered with growing amazement at the Silence settling over the world. Only the oldest and wisest of creatures inhabiting wild seacoasts did not share in the growing perplexity. Motionless on their rocks and on concrete cairns that had once been luxury resorts and condominiums in past eras, they watched the waters and clouds patterns in the heavens, and knew this time of things was drawing to a close, and another was soon to begin. Some of these creatures were human, others not. But, human or non-human, they knew the signs and their meanings. In others, who did not share in understanding, the change inspired fear and foreboding. The Silence could only entail doom, as they saw it. They hated this dreadful Silence, and shook their heads and clenched fists at it. But those who understood something about the Silence looked upon the forces of change with different eyes. They saw an Earth gathering her strength and biding her time for perhaps the greatest and final onslaught against the invaders. Lacking the wisdom of such wise observers, the Rom Gypsies stood to lose their favored trading position with the invaders, the Algol and the Gorgons. They were, thus, alarmed and made nervous as the Silence lengthened and grew, to their sense, all the more ominous. East and West Rom joined in the spreading alarm, and they staged great shows of pomp and pageantry, all they could afford, to cover up their terror. The fears of the master Algol were not so easily allayed. In the growing unease they had second thoughts about the colonization. Was it a mistake? Had they miscalculated concerning the host planet? Did it contain resisting powers they had not detected, innate forces that could destroy them? After all, they had been attacked recently, quite unexpectedly, and sustained such grave damage that they had been obliged to abandon the entire South Continent. They still did not know what being had inflicted the damage. Was it human? Some Algol thought it was human. Others argued that no human possessed such great powers. It was a specimen from some other galaxy, seeking to drive them from their new home, and they needed to be on guard against others of its kind. The attacker had been slain, but when they tried to take it for analysis, the specimen had been whisked away by yet another unknown species. Earth was becoming a very strange place, indeed, to the Algol! They had not counted on so much interference after they had colonized. Some Algol, high-placed and in the confidence of the Queen, recommended that the colony disband and they seek out another planet, more friendly than Earth had proven so far. The vast majority, however, favored Earth, since the Queen favored it. Leading scientists, however, continued to report their findings on the undetermined cause of the entropy in the Earth’s hydrosphere. A conclusion was reached and transmitted to the entire Algol community. It said the current oceanic depression was caused by magnetic lunar storms (the First Moon, and the Second Moon, were showing signs of disturbance) of unprecedented scope. Watching the scientific panel and hearing the announcement, the Algol community breathed easier. At least there was a natural explanation. While the Silence settled over the Earth’s surface, and Molu went to work on the two Moons, certain great forces were stirring beneath the surface, in Roncommon. Though some fragments and some monster-fragments had already escaped of late, most continued to drowse peacefully, just as they had for centuries and eons. Now, as if Molu’s lark on the First Moon had triggered something subconscious, the monster-fragments came suddenly to life. They roared against their confines with rabid tempers. The terrible playthings of the Titans were bored with Roncommon, their gigantic holding tank, and they demanded immediate release into the Upper World from which they had been driven ages before. This change could only mean the ushering in of the end of one world, and the birth of a New, when such forces began to storm at the Gate of Roncommon. Extending feelers they encountered negative resistance--the Door shut against them. Having found it, they boiled with ire and frustration. In the depths of their Stygian consciousnesses, somehow they realized that to open the Door was to escape the unending obscurity of their existence. For millennia, they had dwelt within the boundaries of Roncommon, sunk in the slime of dark cages. But their jailer, the blue Centaur, had vanished! No one took his place. Now they could move about freely, and they did so, seeking the exit Door. In repeated contact with it, they discerned less and less resistance. Then one monster-fragment slipped through, followed by another with a lion’s head and serpent body that could fly and spout fiery streams. Yet another, its multiple hedgehog like snouts and goiter-like throats sticking out of a bloated body the skin of which seemed covered with innumerable beans. Others of equally grotesque shape and wickedness, slowly, but in increasing numbers, followed. As for the first, she surfaced in the East, and like a hurricane moved against the coasts of East and West Romany, devouring the ships and the human population that fell to her as prey. Still, that was no catastrophe for the master race of Algol. One sea-monster was nothing to concern them. Let the Rom deal with it, they thought. Humans, after all, were expendable. As for the Great Silence hanging heavy over the entire waters of the Earth, that was reason for concern. Though explained by their scientists, they keep a close eye on the phenomenon, watching for any change. As for the hard-beset Rom, unable to drive the sea-monster from their shores, they settled on sacrifice as the means to placate the monster. They sent the most beautiful woman in the country, the Princess Andromeda, in chains to the coast. Molu, meanwhile, unwittingly entered into the world scene as an undetermined factor of change, catastrophic change. As soon as he had tested out his powers, he wanted to use them on Earth. He soon grew bored with the Moons, where he had no spectators, and wished to return to his own stomping grounds, to stomp and make hash of some enemy. Caught by surprise, the Algol watched their latest nemesis, transfixed at their view screens. The unknown attacker arrived by air, employing an invincible arsenal of lasers and lightning bolts against them, destroying great computer centers, infrastructures, light-shielding domes. This assailant was well-shielded and survived their laser defense system, the same that had incinerated the last threat against them. The Algol were appalled as they watched their single enemy wreak havoc on the light and UV-shielding dome of their main Space Port, reducing their facilities and several warships of the Cygnusian starfleet to shards. The Port sustained heavy damage, with the surviving Algol and Nergulian allies trapped, reduced to helpless rage and fear, while the hateful foe burned huge swaths through coastal installations. Then, suddenly as he had appeared, he was gone, swept skywards in a whirlwind. Dazedly crawling out of the ruins of the Port, the remnant Algol shook heads as they looked about with incredulity at the devastation. Like flaming torches, several mile-high incubators poured smoke and fire into the sky through the gaping, fragmented dome. Billions of their kind had perished in the attack. Now equal numbers of infant Algol in warming chambers, were exposed to the planet’s temperatures and outside air--perishing before their eyes! and as the Algol who still could moved to flee, they found there was nowhere really to go. The mighty, dreadful Gorgons? Disgusted, seeing that the Crystal had failed to terminate Molu and had turned hostile toward them, they thought the better part of valor was gather their darkness and flee with the swiftness of arrows shot into the night. So they flew off, leaving their allies to face a terrible fate. Not certain they wanted a face-to-face confrontation with Molu, so well equipped as he was at present, they sought refuge in the center of the continent, in recesses of the Mountains of the Moon, where they bided their time until an opportunity to recoup their losses presented itself. If only they had known Molu’s true state. An appointed whirlwind snatched him from the scene of victory, but that was only to knock some sense into him. He had done wrong, and it was now time for him to consider his mistake. With the density of his skull, that would take a certain amount of strong impressions. The first impression was struck--the kind that the Bear Islands (also called the Turtle Islands, East and West), were famous for since the beginning. Funnel like twisters, Titanic Atlases, Ajaxes, and Herculi, that could hurl grass stems through tree trunks without bending the stems, they were powerful to sweep a Two Horned off his hooves. Molu was having the time of his life killing Algol and the Nergul and wrecking a good ten percent of what they had erected on Earth when he felt himself seized bodily and spun upwards into the air. He knew instantly he was in the grasp of a truly Greater Power. That Power could only be God’s breath. The dread cyclone that seized him, transported him quite a distance from Atlantis, then dropped down somewhat roughly in East Bear Island, in the south-central parts that had once been called Georgia. His mouth filled with the local red clay grit, his eyes blurry, Molu snorted and rolled about on the riverbank where he landed. He got up, stamped about, furious with the interruption. Though he knew what had happened, he didn’t like it at all. Before Molu could think what to say, a Voice spoke. You have gone and done what you were not commanded to do. You have walked your own path, and it leads to your great hurt. Why do you not do as you were instructed? You were shown that you should wait on Me. You must wait. I will show you your path, and then you will do well for yourself by following. But you have gone out ahead of Me, and I have not led you. That is why I have brought you here to this distant land. Molu, listening, could not deny one word of God’s reproach, for he could tell instantly when it was God or not. Yet his old, bullish heart rebelled, and he did not want to hear any more of what God had to say. He started off running as fast as he could, following deer trails winding and circling through the thick forest in such a meandering fashion he hadn’t the slightest idea where he was heading. When Molu had run for a long time and thinking he had seen the same rocks and trees again, maybe several times, he stopped, listened and heard no more words, then decided he would continue anyway. It was not such a bad country he was in, he decided, and maybe he could find a clearing to live in. But, as long as he walked, there seemed to be no such clearing. The forest stretched mile upon mile, trackless except for the deer paths, and he quickly grew tired of his newfound freedom in this strange land--unaware that he was passing bands of Indians who observed him but thought he must be some sacred four-legged relative-like or otherwise they would have fought him, not let him go in peace. As he wished in his heart, the Crystal caught up with him. Molu was angry, just the same. He wanted to vent some of his frustration at how he was handled by God. But the Crystal did not plead with him as before. On the contrary, the Crystal talked to him as a master would to a slave. “The first part of our agreement is terminated. You have failed to complete the terms, and--” “But I was taken away by force!” “How do we know that? It is only your saying so, and that is not enough. Now you will serve us, for the second part of the agreement must now be implemented.” Molu understood little of the last statement, but he sensed that the Crystal was going to make him do something, and he didn’t like the tone of that at all. No Crystal would make him do anything! He would destroy the Crystal! “You have no power to do anything to us now!” the Crystal mocked him. “We have blockaded the portals and connecting tubes. You cannot reach us in a million years. Besides, both our uplink and downlink stations are beyond your knowledge and grasp, and with them we can incinerate you if you refuse to fulfill the contract.” As a sign it meant exactly what it said, Molu sustained a direct blast of a laser, and he was sent tumbling head over hooves. Hurting all over, Molu now repented of his folly. He saw that he had made himself a captive, by entering into an agreement with a wicked Crystal. But what could he do? He was helpless against the powerful oppressor. He was its slave. The Crystal, assured of its total control over Molu, now instructed Molu how he was to ambush and attack the Atlantean starfleet stationed behind the First Moon. The Crystal knew the Atlanteans could not withstand an unexpected attack combining lasers and lightning bolts. Where the lasers could not penetrate armor and shields, the lightning bolts could. Where the lightning bolts failed, the lasers, with their delicate probing, surgical pin-pointing accuracy, would find an opening. A battle masterplan was already conceived. Even though the Crystal possessed only one power grid, called in former times the “Bermuda Triangle,” and has lost the one located in the “Devil’s Triangle,” one was enough, though half-operational since the re-emergence of the Atlantean continent. Next to it only the quark engine in the Crystal Mountains was greater. Since the Gorgons had discovered it, the Crystal knew that the Atlanteans--creators of the Gorgons--would eventually take notice and move to reassert control over its powers. Surely alerted by Molu’s rampage on the First Moon, they had to have tracked his movements all the way back to the Hidden City. They would now be considering the role the Crystal might be playing, and also how they should respond. Their response, then, would not be long in coming. The Crystal needed to make a preemptive strike. Having been free of external control for thousands of years, the Crystal was not going to let that happen without a struggle. Molu had stumbled into the equation, and the Crystal saw how he could be used, as a free-moving agency, equipped with the Crystal’s levitational power and lasers as a supplement to his own firepower. With Molu as the CPSU’s fighting arm, the Atlanteans and Gorgons could be driven off, even destroyed. After his mission was accomplished, he would be terminated, of course. Poor Molu! He wanted nothing now but to run to Daniyel, who would know how to make things right. Now he had gotten himself enmeshed in the clutches of a wickedness that he could not hope to escape. He thought of Daniyel. He thought of God, the Almighty El Elyon, who loved such as Molu, and has said so on numerous occasions. Was it really so? Did the Almighty have a plan for him? Was it still possible that the Almighty would listen to him and maybe deliver him from the grasping, tyrannical Crystal? Molu, thinking he had nothing to lose, bellowed out his need to the God he had come to know through Daniyel. How can a young man cleanse his way? By taking heed according to Your word. With my whole heart I have sought You; Oh, let me not wander from Your commandments! Even should he be restored to his former position as E, Molu’s mission had been radically changed. He had not done as instructed, and so all the plans for him were modified. Someone else in the DUBESOR team, if he could be found and recruited, would have to complete what Molu had stumbled into and left unfinished. Now as for future responsibilities, Molu ‘s repentant heart was reason for hope he would still be used in a mighty way. The Gorgons had vanished temporarily from public life, but they were still highly dangerous and needed to be dealt with since they lived, virtually, forever. Was Molu up to it? Meanwhile, the Atlanteans moved to take control of the plasma trade, since it had fallen off so sharply of late they needed to take direct action or face unacceptable shortages. Elektra issued a communiqué to all under her command. Stung by her loss of a harvester and one power crystal to an unknown assailant, she was all the more furiously determined to get her way in this matter of the plasma. It mattered nothing to her that she would upset the Algol, her touchy underlings, and terrorize the allied, tributary Rom by taking plasma direct from captives she made herself of Rom citizens. This act was considered grounds for conspiracy and revolt by the injured parties. Only they were hardly going to announce the fact publicly and risk Elektra’s war machine of two dozen carrier class warships carrying approximately 12, 000 personnel (Atlantean nobility as the officer corps, robots for tracking and surveillance, logistics and sub-command positions, and slaves for maintenance), falling upon them with the full weight of her wrath. As for the effect she might incite, Elektra was so sure of herself, despite the fact her damaged fleet was like a wounded lion, that she would always be able to beat off any possible retaliation. Supreme and unassailable in her own mind, the queen of Titanic vampires let her communiqué go to the Algol and the Rom, just to inform them, if they didn’t appreciate the fact enough, that they were both under her gilded heel--forever, and without recourse.